Responding to grassroots pressure from advocates, and mounting criticismfrom congressional leaders such as Mike Honda (D-Calif.), Immigration and Customs Enforcement (ICE) unveiled an 18-page memorandum for the care of transgender immigrants in detention this week. 1. Detention of vulnerable immigrants is inherently inhumane: The new guidance does nothing to move us away from the prolonged detention of transgender individuals, the vast majority of whom are asylum seekers who have already faced persecution in their home countries, only to be subjected to further pain and suffering at the hands of ICE. Detaining asylum seekers is inhumane, re-traumatizes some of the most vulnerable immigrants and it is contrary to our laws when detention is used as a form of deterrence to dissuade people from coming to the United States. Advocates have repeatedly called on Immigration and Customs Enforcement (ICE) officials to release such detainees once they have proven that their fear of persecution is credible. Officials should act to end the practice of detaining such individuals, as there is no mending it. 2. The new guidance provides inadequate care and housing options: The guidance continues to allow practices that have been denounced as inhumane, such as administrative segregation, ‘protective custody’ and isolated pods for transgender detainees. ICE detains 75 transgender immigrants on average, which is less than one percent of the detainee population, but over 20 percent of sexual assault cases in immigrant detention involve a transgender survivor. Alternative housing practices havefailed to protect transgender immigrants in detention from sexual assault and physical abuse in the past, and should not be used when releasing such detainees on bond or parole is a much more humane and cheaper alternative. 3. No guidelines for the treatment of vulnerable immigrants such as lesbian, gay and bisexual asylum seekers: Many individuals seeking asylum in the United States are detained upon arriving at a port of entry. Many of them, including lesbians, gays and bisexuals, have suffered severe persecution in their home countries. A recent Center for American Progress report shows that ICE routinely detains LGBT immigrants who it knows are at great risk and should not be behind bars. A disproportionate number of undocumented LGBT individuals are Asian American. The new guidelines do nothing to recognize that these individuals, who may have suffered sexual assault and torture in their home countries, remain vulnerable in immigrant detention and should be released. 4. No guidelines for dealing with sexual assault and abuse in detention:Transgender immigrants in ICE custody face extremely harsh conditions such as alarming rates of sexual assault, physical abuse and harassment. While housing them according to their gender identity may reduce some of the violence transgender detainees face, the guidelines provide no mechanism for reporting ongoing violence. Forty percent of sexual assault cases in detention are unreported, and the guidelines contain no mention of how transgender immigrants can report assault, or any measures to protect transgender immigrants from such assault. 5. No enforcement mechanism — The ICE ERO working group that crafted this guidance worked hard to meet with transgender detainees and try to ascertain best practices for the detention of transgender individuals in custody. However, without a grievance mechanism, the guidance may be tough to enforce at all facilities. 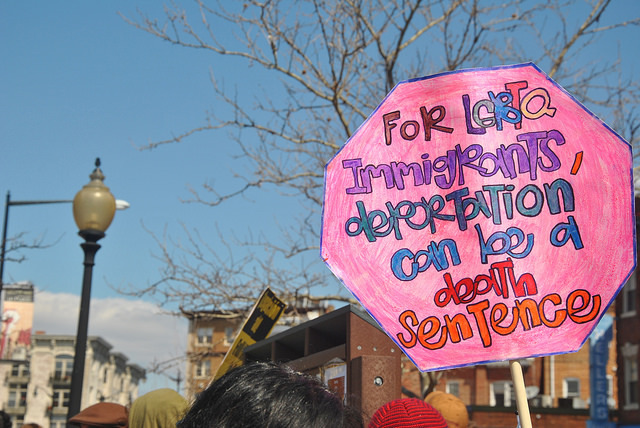 We strongly urge the ICE ERO working group to consider alternatives to detention for LGBT and other vulnerable immigrants in detention.